The supremely hardy star jasmine grows anywhere - sun or shade - with starry white flowers and glossy emerald-green leaves. This easy-care viney shrub could take prizes for being the plant that goes anywhere. It takes the cold, the heat, the blazing South Florida sun or a shady bed, even wet conditions. This is one plant anyone can grow. It has an informal, "nature-did-it" kind of charm and can grow wide so allow it room to fill out. Its rambling habit can be too wild and crazy for a limited space, and the vine-like nature will take over, causing it to climb over things in its way. Lightly scented flowers appear on and off all year on this "true" jasmine. Many plants are called jasmines, though they belong to completely different plant families. And don't confuse this plant's name with Confederate jasmine, a vine that produces heavily-fragrant spring flowers. Confederate (Trachelospermum jasminoides) is sometimes called Star. Star is a fast grower you can keep about 4 feet tall. It's not choosy as to light conditions, taking sunny or shady locations in stride. It's also one of the few plants that doesn't mind "wet feet" - an area that stays moist after a hard rain - making it a valuable option for people trying to landscape this kind of challenging area. 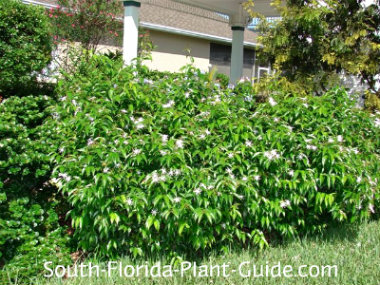 This jasmine shrub is cold hardy and does well anywhere in South Florida. Add composted cow manure to the hole when you plant. If the area is dry, add in top soil organic peat moss as well. Trim as needed to keep the plant well shaped, but allow it to take on a natural mounded form. Trim off long tendrils fairly often to keep it looking its best. Water regularly. 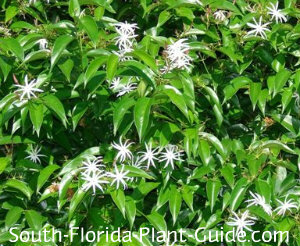 Fertilize star jasmine 3 times a year - once each in spring, summer, and autumn - with a good granular fertilizer. Place these plants about 4 or 5 feet apart. They do grow very wide and fill out fairly quickly. Come away from the house 3 feet (or more). If placing by a walkway or drive, come in at least 4 feet to keep your trimming chores to a minimum. Too close and you'll have to fight the plant to keep it in bounds. These shrubs work fine in large containers or planter boxes. COMPANION PLANT SUGGESTIONS: Depending on the light, consider tibouchina, gardenia, white bird of paradise, cordylines and dracaenas, firespike, chenille plant, alocasia, and variegated ginger.